When I go to the grocery store, I tend to purchase much more than originally intended. To make matters worse, my usual grocery store seems to have more and more self-checkout registers every time I go. When I am ready to leave, my grocery cart is usually overflowing with items. Then I am expected to act like a cashier because I have to scan each item myself and finally pay a machine. I estimate I spend an extra 12 hours a year in the grocery store working as a cashier at the self-checkout register. Imagine if I could simply walk up to the register and in a second, every item in my basket is instantaneously scanned without ever having to remove an item. Radio-Frequency Identification (RFID) is a technology that could make that wish come true. In fact, RFID can be used in many situations when an asset needs to be tracked. Many organizations use barcode scanners to track IT assets; however, barcode scanners require someone to see the asset and then find the barcode so it can be scanned. Much like barcode tags, RFID tags contain a unique identifier. RFID tags need to be read by an RFID reader just like barcode tags need to be read by a barcode scanner. The difference is that RFID readers use radio frequencies to communicate with an RFID tag instead of a line-of-sight scanner. RFID tags come in two formats: Active and Passive. Active RFID tags have a battery so they can be set to automatically broadcast the asset information using a radio signal on a regular interval. The signal is picked up by an RFID reader located in the area. 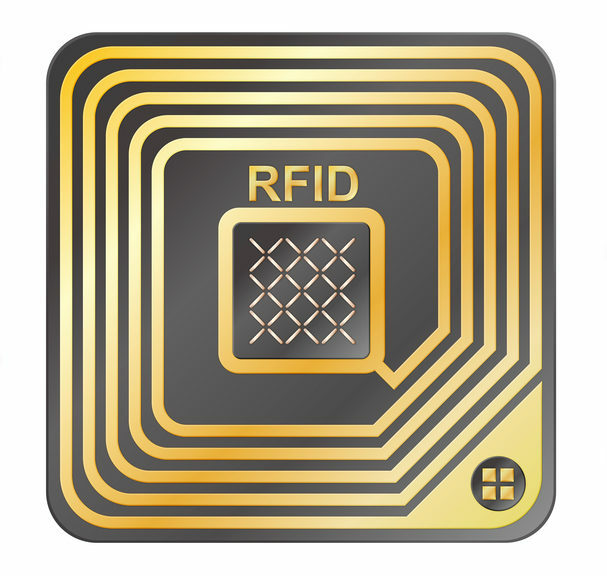 Passive RFID is when the tag is electrically charged when it is within range of the RFID reader, causing the chip in the RFID tag to power on, and send the tag’s unique hexadecimal value to the RFID reader. Passive RFID is commonly used to track assets as they enter or leave a dedicated area such as a room. Can RFID technology help IT asset managers meet ITAM objectives? To fully understand if RFID will help you with your ITAM objectives, it is important to understand how it works as well as its benefits and/or limitations. RFID capabilities include asset monitoring, asset tracking, checkpoint tracking, and bulk lifecycle updates. Asset monitoring requires “active RFID” so that assets can send the asset information to a dedicated RFID reader at regular intervals, which is important in an environment containing assets with sensitive information. Alerts can be set when critical assets stop reporting to the asset management system; however, the problem with active RFID is that the battery on the RFID tags will eventually need to be replaced. Dead batteries can result in a false “asset missing” alert. RFID provides the ability to instantly track assets within a building or room without having to scan individual assets, which will save IT administrators a great deal of time. I have witnessed IT employees walk through buildings scanning the barcodes of assets they can see. I have also seen inventory reports raise an alarm because some IT assets were not located using a barcode scanner due to human error. In one case, a laptop that was thought to be missing was simply locked in a drawer in someone’s office. If that laptop would have had an RFID tag, it would have been discovered by a mobile RFID scanner. Checkpoint tracking is the ability to log an asset when it passes through a doorway or a checkpoint. For example, IT assets with an RFID tag could be logged as they enter or leave a building. Organizations that have sensitive data on PCs or laptops can be notified if an asset passes through a checkpoint. Organizations with employees that share IT assets, such as hospitals could benefit by using RFID tags. Checkpoint tracking can give administrators insight to their operational landscape by showing when and where IT assets are used. For example, assuming a nurse uses a tablet throughout the day, the hospital could track and measure the time each nurse spends with a patient or client during therapy, and how many rooms were visited by that nurse over a given period of time. For IT asset administrators, RFID provides the ability to make bulk status changes to assets. For example, a room full of old laptops with RFID tags could instantly be changed to “decommissioned” without making contact with each IT asset. Making bulk asset lifecycle changes can be useful for IT service centers, loading docks, and receiving docks. RFID tracking might not be for everyone doing IT asset management; however, there are some industries that could benefit from using RFID as part of their IT asset management solution. Educational institutions, medical institutions, police agencies, and manufacturing facilities are just a few examples where RFID technology could be helpful when operating an ITAM solution.